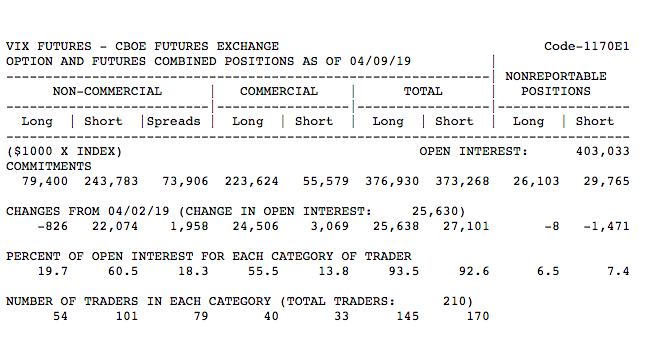 From the CFTC data above we can conclude that while non-commercial short positioning/exposure is high relative to long exposure, it’s quite the opposite in the commercial complex. Moreover, the short exposure in futures is the plausible byproduct of volatility targeting fund flows that previously demanded an increase in VIX-ETP shares outstanding. Most importantly and we can’t stress this enough, current positioning will likely cap volatility spikes as there is enough length in the leash/positioning long that will be incentivized to take profit WHEN volatility ticks up… But there is not enough short interest to drive large squeezes higher. Additionally, this does not insist a volatility spike can’t occur from an exogenous event and find market liquidity rapidly washed out of markets. There is a great deal of calculus involved in quantifying implied volatility and thus drawing conclusions. The entirety of the VIX-complex is derivational in nature and defies a great many traditional analytical exercises/practices. One such practice I shy away from, which is also validated by within most Technical Analysis (TA) certification courses is the practice of TA within the VIX-complex and upon the VIX itself. The very nature of the VIX being a derivative of. SPX OTM option activity producing the oscillation of the index bears no need for TA. There’s an eventuality intrinsic to the VIX. Eventually, the VIX will spike, then decay and mean revert with time before eventually finding a new low reading. That new low reading can take decades, but it will occur. 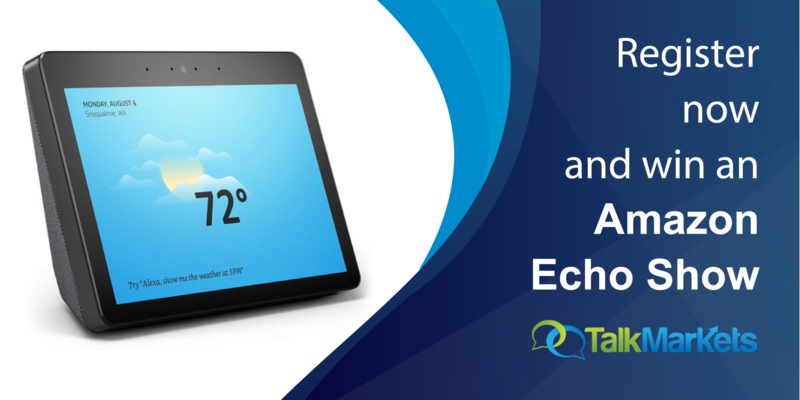 Nonetheless, TA is often used by market participants to mark the eventual rise in the VIX. Sven Henrich, a.k.a. 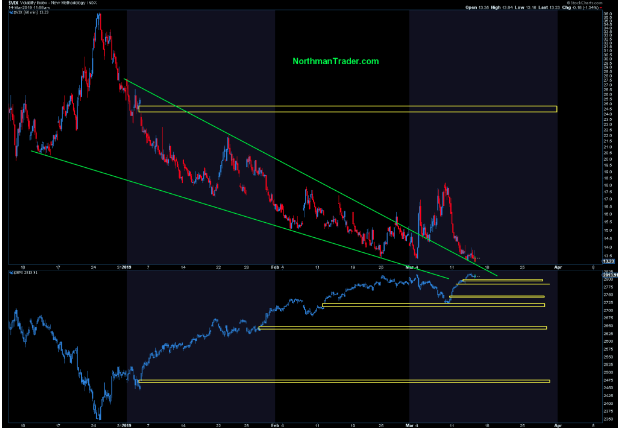 Northman Trader recently fell prey to the fallacy of practicing TA on the VIX. In an article authored on March 15, 2019, (a month ago for which most positions who assumed a long VIX position would have taken a loss for most any instrument of choice) Henrich warned of a near-term VIX event. The effort was titled “Brace yourself for the coming spike in the VIX”. “We saw one in 2015 following the August 2015 correction, and another big one in early 2018 following the February correction and, we just witnessed one again following the December lows, a pattern that produced a quick spike from 13.5 to 18 last week prior to this current options expiry week. So let’s quickly review Henrich’s quote above. Yes, there was a spike in VIX for that period ahead of options expiration week. BUT, that spike quickly evaporated within 2 trading days. How do you position ahead of such an event and to benefit directly within the volatility complex? Where does one enter and exit and with what variety of instruments? Based on how quickly and routinely volatility is shoveled out of the market after a spike, why would one position for it? Where would the confidence in positioning come from, not knowing when the volatility spike will end precisely? The gaps up in volatility are just as measurable as the gaps down after a spike. In other words, what is Henrich really offering in his narrative given that positioning ahead of and for a VIX spike often proves negligible at best and a tax on portfolios at worst? It’s really a rhetorical question, as we know the only value in publishing such content is intrinsic. Based on the tenor of the article, it simply stokes fear in market participants who otherwise lack market experience. But let’s look at more of the narrative. This week’s compression, while producing lower prices, appears to simply retest its broken trend line. Note also that VIX has a glaring open gap in the 24/25 area. The year is young still, and there is plenty of room to eventually fill this gap. As Henrich mentioned earlier, gaps in the VIX are always filled; it’s just a matter of when. Which is why he also states, “While some gaps can stay open and unfilled for years this large number of open gaps are unlikely to remain unfilled for an extended period.” Nothing wrong with a little “CYA” right? Remember, this narrative from Henrich was written a month ago Monday. The exercise of discussing the eventuality factors of the VIX need no TA, they simply need a volatility targeting strategy and the existence of time. Since Henrich’s article, if one hedged their portfolio via the VIX-ETP complex, they would have entered a very painful trade and likely taken losses, otherwise known as a tax on one’s profits. It’s for this reason that the majority of time, the non-commercial net speculative futures positioning is net short. Most people simply wait out a volatility spike, roll positions and/or add more short-VOL positions as the VIX spikes. We know a VIX spike can’t last forever and the decay period can be extensive. In no way, shape or form am I suggesting a VIX spike isn’t in the cards, but rather given the current gamma offloading, hedging with VIX-ETPs, spikes will be of lesser consequence and short-lived. This statement also presumes a larger spike, given the present implied volatility, but with quick reversion. Next week is Good Friday and as such the stock market will be closed on Friday. Last week’s S&P 500 weekly expected move was a meager $31/points for which the index closed within the weekly expected move and after hitting a high point of roughly 2,911. That high-water mark went unnoticed by many, but it represents a key gravity point that found the index trading in and under the 2,911 level and before breaking to new highs in September 2018. So in falling back below 2,911 to end the week, we’ll have to keep this gravity point in mind with bank earnings rolling out in the week ahead. As shown in the screenshot above, for the shortened trading week and with volatility hitting it’s lowest level of the year on Friday, the weekly expected move has decreased. This coming week, options are pricing in a weekly expected move of just $27/points. We’re not sure that’s not going to be eclipsed in one direction or the other with a majority of banks reporting and Wells Fargo (WFC) not looking so hot after reducing guidance. Certainly, J.P. Morgan Chase’s results were strong and handily beat analysts’ estimates, but best of breed companies/stocks should produce such a performance. It’s easy to declare that the YTD market rally remains absent positive fund flows and with the usual hedge fund underperformance, however, it’s not so easy to qualify when that paradigm will shift. About $90 billion has left equity funds this year, including $2.6 billion of outflows in the week through April 10, according to a Bank of America Corp. report that cited EPFR Global data. 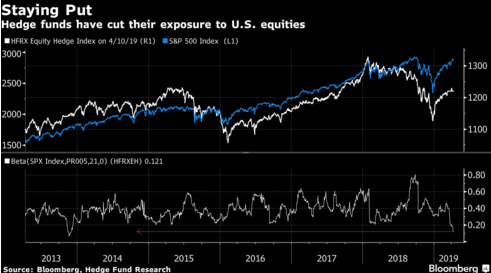 Fast-money exposure to U.S. equities has plunged to the lowest since 2013, according to an estimate of the portion of their returns attributable to the S&P 500 Index. Other data show the ratio of bullish bets to bearish ones near the lowest in more than a year. CTAs and trend targeting funds are still on the sidelines and holding firm to their “bets”. “It’s a sign that hedge funds remain steadfast in their refusal to chase the rising market as they opt for nimbler trades -- rather than a warning that the smart money is aggressively selling into the rally, according to Nomura’s quantitative strategist Masanari Takada.